Summer’s favorite squash roasted and stuffed with seasoned ground beef, rice and tomatoes, baked and topped with melted provolone cheese. 2. Slice each zucchini in half lengthwise and scoop out seeds, leaving about a half inch all around. Brush inside and outside with olive oil, and liberally salt and pepper. 3. Line baking or casserole dish with foil. Empty can of tomatoes into it, including juice, and sprinkle tomato seasoning over it. 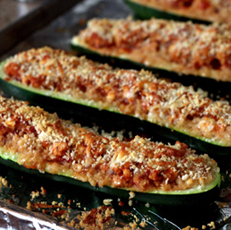 Place zucchini boats skin side down in dish. Divide stuffing in 4 portions and fill zucchini. Cover with foil. 3. Bake 15 minutes at 400 degrees. Remove foil and bake another 15 minutes or until zucchini is cooked soft all the way through and stuffing is well heated. 4. Layer slices of Provolone cheese on top of zucchini and bake a few more minutes, just until cheese is melted. This entry was posted in Italian, Recipes, Vegetables! and tagged ground beef, rice, stuffed, tomato, zucchini. Bookmark the permalink.